MONROVIA, Liberia – Life is not often easy for Liberia’s young people. It has been 14 years since the end of a brutal civil war, but in many ways communities are still reeling. Poverty is rampant, school enrolment rates are low and adolescent pregnancy rates are some of the highest in the world. But with politicians gearing up for an election, youth leaders have found an opportunity to demand action. On 28 April, heads of the country’s political parties signed a National Youth Manifesto, which lays out the needs of young people. The action signalled their intention to address young people’s well-being in their campaigns and platforms as they prepare for elections in October. It is a “first-of-its-kind and historic collaboration between political parties and Liberian youth,” said Augustine Tamba, president of the Federation of Liberian Youth (FLY). 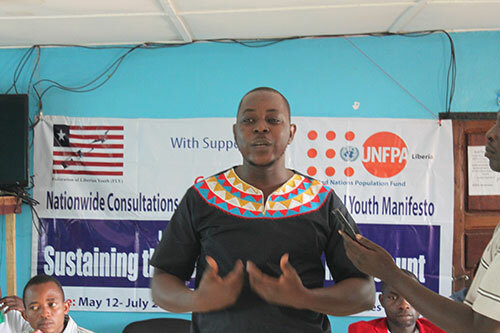 “We, the young people of Liberia, want political parties’ commitment to ensuring that critical issues affecting our well-being and development are part of their agendas, platforms or manifestos as they seek our votes in October 2017,” said the National Youth Manifesto, a document produced after months of consultations with Liberia’s young people. The year-long process of drawing up the manifesto was supported by UNFPA, the Carter Foundation and FLY. 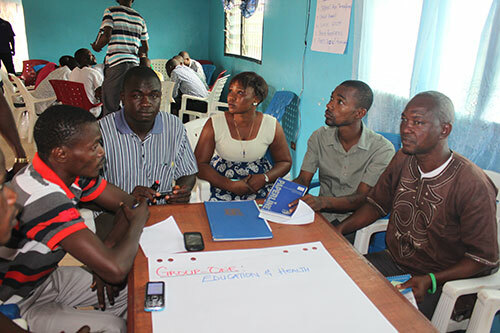 It culminated in the Youth Peacebuilding Conference, held in Monrovia at the end of April. About 150 young people attended, representing different regions, ethnic groups and organizations. The resulting document calls for, among other things, quality education and health care, with a special emphasis on the need for services to meet young people's sexual reproductive health needs and rights. It also calls for the meaningful participation of young people in decision-making about issues affecting them – including peace-building. It is “a genuine step towards breaking the longstanding barriers of youth exclusion in our country’s developmental and peace building agenda,” said Mr. Tamba, who, at 35, is still considered a youth under the definition of the African Youth Charter. 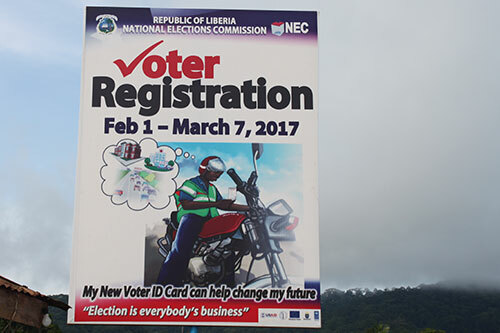 The upcoming elections – both legislative and presidential – are a key moment to address the many issues that affect Liberia’s young people. Fifty-four per cent of the population lives on less than $2 a day, according to the World Bank. And young people face persistently poor access to sexual and reproductive health information and care. Girls, in particular, are vulnerable to exclusion from school and health services, as well as exploitation and abuse. Girls are also extremely vulnerable to early motherhood. According to the latest data from the State of World Population, Liberia has 49 births per 1,000 girls aged 15-19 – one of the highest such rates in the world. A 2013 survey held that almost 60 per cent of girls have had children or are pregnant by age 19. Liberia also has one of the world’s highest rates of women dying from causes related to childbirth, an issue closely tied to adolescent pregnancy. Globally, pregnancy-related complications are the leading cause of death among adolescent girls. The Youth Manifesto presents a clear blueprint for incoming leaders to address these concerns in their efforts to foster progress, productivity and development. It was signed by the leaders of 22 registered political parties. The ceremony was witnessed by government representatives, a host of UN agencies led by the Resident Coordinator Yacoub El Hillo, and as well as foreign missions and development partners.